Regular Yes, if the guide's owner, an assigned editor, or has the Edit All Guides permission. Edit your guide and click on the page containing your blog. Click on the Add Post button to start a new post. Enter a ​Post Title. Think of this as your post's headline. Your post's friendly URL will automatically be generated based upon your post title. To customize this, click on the pencil () icon. Insert Database assets: want to advertise that new streaming video database you purchased? Now its easy! Just click on the A-Z ( ) button to reuse the database from your A-Z database list. If you'd like, you can add an optional teaser to each of your posts. 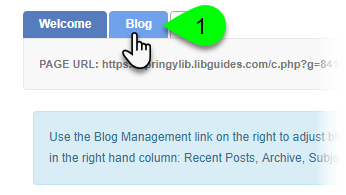 For system blog posts, this teaser text will appear underneath the post title on your LibGuides homepage and can also be displayed in blogs widgets. This is a great way to lure users in to read the full post! However, be sure to keep your teaser concise -- there's a 255 character limit. In the Subjects Tags field, you can assign subject categories to your posts. The available categories are set by your site's administrator under Admin > Metadata & URLs and are the same subjects you use for guides and databases. When you assign a subject category to your post, this will allow your readers to filter your blog to view all posts assigned to that subject. 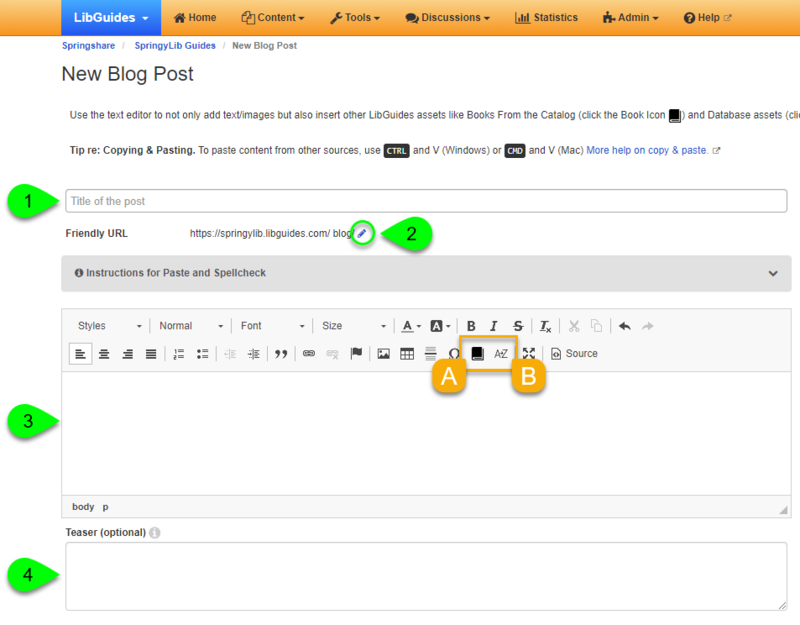 In addition, blog posts assigned to a subject will appear on that subject's landing page. For example, if you assign the History subject to your post, it will appear on the History subject page -- right alongside the guides and databases you've assigned to that subject. 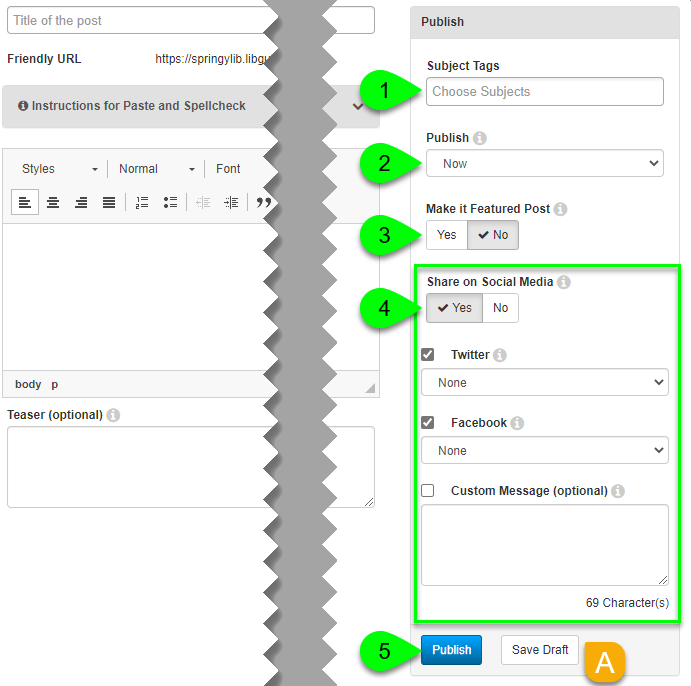 From the Publish dropdown, you can choose to publish your post right away, or schedule a time to publish it. If you choose to schedule your post, LibGuides will automatically publish it on the date and time you select -- great for announcing new services or resources! Set the Make it Featured Post to 'Yes' for the post to remain pinned to the top of the blog. Set to 'No' and it will fall back into chronological order. Pinning a post can be helpful if you want to profile it for a certain period of time (for example, upcoming changes to library hours or an upcoming community event). Note: There can only be one featured post on a blog at a time. If you would like to share your post on Facebook and/or Twitter, set the the Share on Social Media option to Yes. Select the checkbox next to each platform you want to use and select which account to post to. When your post is published, it will be shared to those accounts. If you would like to customize the text of your social media post(s), enter it in the Custom Message text box. When posting to Twitter, use the character counter below the post to keep track of how many characters you've added (please note: 25 characters are reserved for the post URL). Twitter limits posts to 280 total characters. The Custom Message is optional -- if left blank, the post will simply contain the title and a link. Not seeing your Twitter or Facebook accounts? Your LibApps admin can add them in your LibApps Social Channels settings. If you are ready to post, click on the Publish Post button (if you are publishing now) or the Schedule Post button (if you scheduled the post for a future date). If your post is still a work in progress, click the Save Draft button to save a draft and work on it later. Then, once you're ready, you can edit your post and publish it. Click on the post's cog () button. Select Edit from the dropdown menu.